Finally, Ardbeg 10. I’ve been looking forward to reviewing this. I’ve had a bottle for almost a year. I drink it, like most of my single malts, sparingly. It’s in a class I call Damn Fine Whisky. So, what’s it got? The Ardbeg label. No false modesty here. Click for full size crop. We want you to read the small print! Yeah, they have some attitude, declaring right on the label: not only the best Islay malt, but the best whisky in the world. That’s fightin’ words for the folks at Bunnahabhain, Lagavulin and Laphroaig. So, what’s behind the bluster? 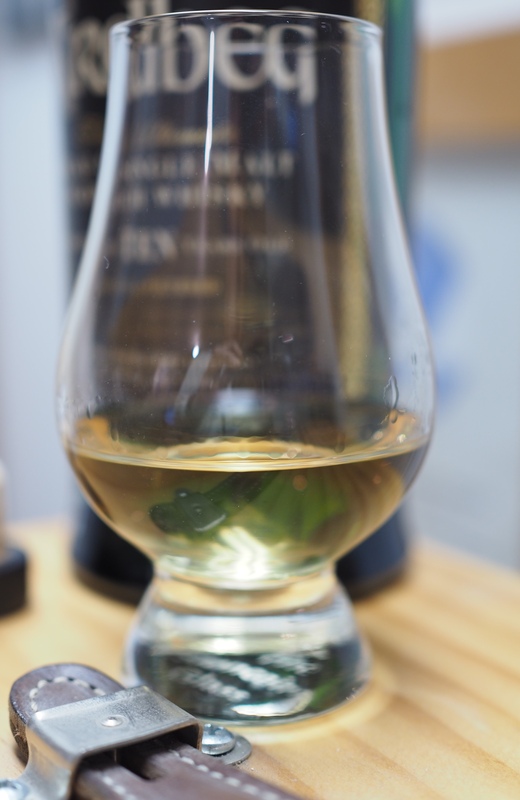 A glass of Ardbeg 10. Yes, it is that light; yes, it has the power (of taste). A testament to the silliness of coloring whisky. The craft-oriented approach is part of their success. First off, they are relatively small, rated at about 1.2M liters per year of spirit. Next, they eschew chill filtration. I’m not partisan in that war, but I think there’s something special in Ardbeg’s offerings, and perhaps that’s a part. The fact that the filtration removes fatty acids may have something to do with the unctuous mouthfeel, and everyone knows fats carry flavor. The higher alcohol percentage helps also — and this is a whisky I can drink neat, no water at all, a testament to the smoothness at 46%. The wash backs at Ardbeg are made of Oregon pine. The wood helps to impart an estery, carbolic flavour to the fermenting wash. Fermentation time at Ardbeg is longer than other distilleries because of the high phenolic content of the original malt. I read that after I did my tasting notes, so the pine tar I noted was fairly sussed out from that Oregon pine. Oh, and talking about pine, in the photo above, the top of my amp is clear pine, shellacked, and the colors are quite complementary. I don’t stain my woods, and Ardbeg doesn’t color their whisky. I like that. Whether e150 adds (unwanted) flavor or not, I don’t know for sure, but you can be sure there isn’t any in the Ardbeg expressions. More of that craft thing going. This is an old distiller, and yet new. Founded about the same time as Highland Park (1798), Ardbeg has been active most of the time since (it was closed for most of the 1980s). They haven’t done their own floor maltings since 1981, but I think their success at astounding peaty flavor (over 50ppm phenols, yow) attests to the fact that the Port Ellen Maltings do a fine job producing malt. Also, the Ardbeg distillery having been closed for most of a decade means they have lots of old spirit around to mix, and I’m sure that’s why their NAS offerings are so damn good (and expensive). More on them in a future post. This is already a long post so I’ll wrap this up with a reference — you should read their bit on distillation here. They’ve got almost as much information as Glenfarclas about the whole process, but they really lavish the details on the distillation process and particularly how they balance the phenols in the final spirit, despite the punishing levels of phenols in the malt. Nose: A big dose of phenolics: pine tar and eucalyptus but no ashy smoke. Getting in closer brings out earth, sweet malt, oranges, fall leaves. Palate: What hits you is a luscious oily mouth-feel, a big bite of earth in the center while smoke billows from the sides of the tongue. At the tip of the tongue we have a touch of golden syrup behind a veneer of orange zest. Finish: Looong! The phenols and orange zest fill the nose, while hardwood smoke lingers on the tongue. There is enough sweetness to remind you of the lovely balance for a good time but that smoke will be with you for an hour. Bottom Line: Buy some! This whisky talks big, and it delivers. And for about $48 locally, it hits above its weight. For the price of Laphroaig’s 10, you have a non-chill-filtered, 46% dram that’s the duded-up gangster in spats to Laphroaig’s classic and well-balanced but slightly vulgar pirate dandy. And what of Lagavulin 16? I really like the Laga, but it’s a sherry-matured whisky, where Ardbeg is matured in oak untainted by any fruit. Ardbeg’s 10 is a purer whisky experience than the Laga, with a more subtle nose — Lagavulin’s 16 is quite a smoky expression. So Lagavulin would be the wealthy but ever-so-tweedy squire to Ardbeg’s gangster. Again…if you enjoy a peaty whisky, buy some. 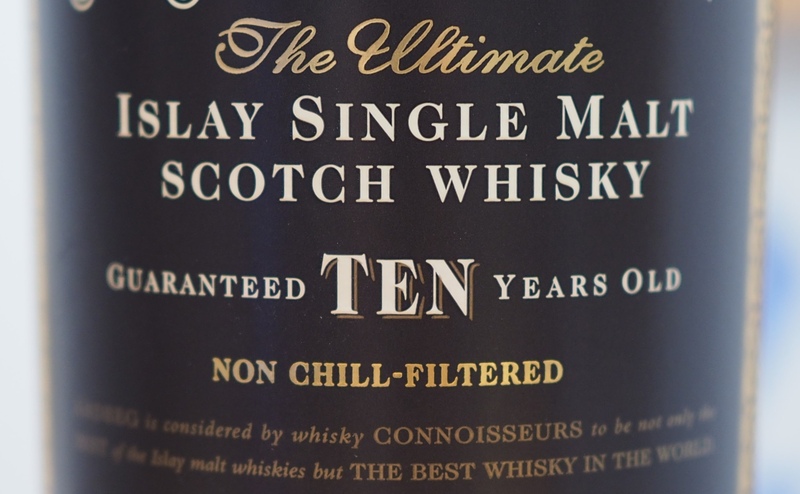 This entry was posted in Scotch-single malt, Whisky and tagged Ardbeg, Islay, peat, Scotch whisky. Bookmark the permalink.